ST. LOUIS, MO (September 8, 2015) –The St. Louis Cardinals are announcing their 2016 regular season schedule today in conjunction with Major League Baseball’s league-wide schedule release. The Cardinals open the 2016 season on Monday, April 4, at their National League Central rival, the Pittsburgh Pirates, marking the fifth consecutive season they have opened the season on the road and the first time in Pittsburgh since 1977. They close the 2016 season at home against the Pirates on October 2, at Busch Stadium. St. Louis will play three games in Pittsburgh before finishing their first road trip in Atlanta (April 8-10) for three games in their final regular season visit to Turner Field. The April 11 (3:15 p.m. CT) home opener in St. Louis will commence a nine-game homestand, at Busch Stadium starting with the Milwaukee Brewers, marking the second straight season they have played the Brewers in their home opener and the fifth in which they have played their home opener against an N.L. Central club. The homestand continues with two more games against the Brewers before playing the Cincinnati Reds (April 15-17) and Chicago Cubs (April 18-20) in three-game series. The April schedule continues with a seven-game N.L. West road trip to San Diego (April 22-24) and Arizona (April 25-28), before returning home to conclude the month and begin a 10-game homestand with games against the Washington Nationals (April 29-May 1), Philadelphia Phillies (May 2-5) and Pirates (May 6-8). The Cardinals 20-game Interleague slate includes the five opponents of the American League West and their cross-state rival, the Kansas City Royals. The first Interleague series begins on the road in Anaheim against the Los Angeles Angels (May 10-12), part of a Southern California road trip that also includes the Los Angeles Dodgers (May 13-15). The Cardinals will also play the Seattle Mariners (June 24-26), Royals (June 27-28) and former N.L. Central foe the Houston Astros (August 16-17) on the road; while hosting the Astros (June 14-15), the 2011 World Series opponent Texas Rangers (June 17-19), the Royals (June 29-30) and the Oakland Athletics (Aug. 26-28) to complete their Interleague play. 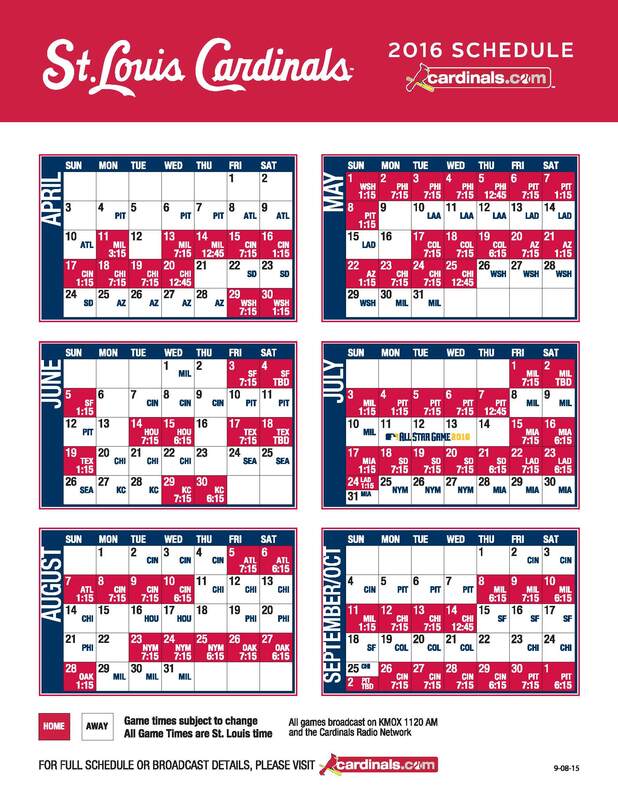 The Cardinals will play 19-of-22 games at home between June 29 and July 24, with a three-game road trip to Milwaukee (July 8-10) and the Major League Baseball All-Star Break (July 11-14) in the midst of that stretch. The lengthy home slate is followed with 19-of-25 road games beginning with their longest (10 games) road swing of the season to New York (July 25-27), Miami (July 28-31) and Cincinnati (Aug. 2-4). The stretch is broken up by a six-game homestand against the Braves (Aug. 5-7) and Reds (Aug. 8-10), before returning to the road at Chicago (Aug. 11-14), Houston (Aug. 16-17) and Philadelphia (Aug. 19-21). The Cubs visit St. Louis three times during the 2016 season but do not have a weekend series scheduled, playing at Busch Stadium three times in a Monday through Wednesday series (April 18-20, May 23-25 & September 12-14). The Cardinals play two weekend series at Wrigley Field (Aug. 11-14 & Sept. 23-25) and a midweek series June 20-22. The Cardinals final road trip of the season is a nine-game trip to San Francisco (September 15-18), Colorado (Sept. 19-21) and Chicago (Sept. 23-25), before concluding the regular season schedule with a seven-game homestand against N.L. Central opponents the Reds (Sept. 26-29) and Pirates (Sept. 30-Oct. 2). St. Louis will play 45 games at home before the All-Star break and 36 home games after the break. The team has 11 home dates in April, 17 in May, 10 in June, 17 in July, 12 in August, 12 during September and two in October. They will play one holiday home game on Independence Day (July 4 vs. Pittsburgh). The Cardinals will make future announcements regarding game times, ticket pricing and ticket availability for the 2016 season. To see the full 2016 schedule, visit cardinals.com.